The last page of this fateful year’s diary. The sec. front over 100 days old and we are over the border of Germany, a 6 mile breach in the Siegfried Line and we are hoping for peace by the end of the year. So much is altered for us all this year. We do not look for Peace, at least I do not, with any particular hope or fear, except that I long for Ron’s return. I have sometimes cherished a defective or cracked article for a long time, then one day it has fallen apart and I have realised that it can never be restored, with a queer empty feeling of regret and loss. In thinking of my sorrow one day I had that same feeling, but greatly intensified and it suddenly came to me that what I had been holding so carefully and trying to hide, was my heartbreak and that I had suddenly realised, it was really broken and nothing could ever really heal it. One does not die of a broken heart or at any rate not at once and it may be that I shall recover in some part and find a measure of happiness as it is my duty to do in my children, but at present I feel that nothing can heal it in this world. Only the hope of a world where there is no parting can help me now and the feeling that God is a very present help in time of need. The price of liberty for us, who wait in fear. Yet, scarcely fear, we trust in God and them. Our aim is true and God is Lord of life and death. He shall direct our path. That soon shall be a memory, until eternity. As elvers in a stream slip thro’, bound for the far Sargasso Sea. Too soon for us we hear them at the gate. Thur Jan. 13 1944 9.15. PM. The month of the poem date was unclear. If it was 5th June 1944 it could have been prompted by a premonition of D-Day – the very next day, 6th June,* which was supposed to have been a closely guarded secret until the actual day. 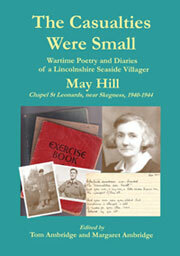 However, the poem might have been written six months earlier, coinciding with the Diary entry on 5th January. *This link will become active on 6th June 2014. Than written in the books that went before. I wonder what will have happened in this grim struggle before these few pages are filled. 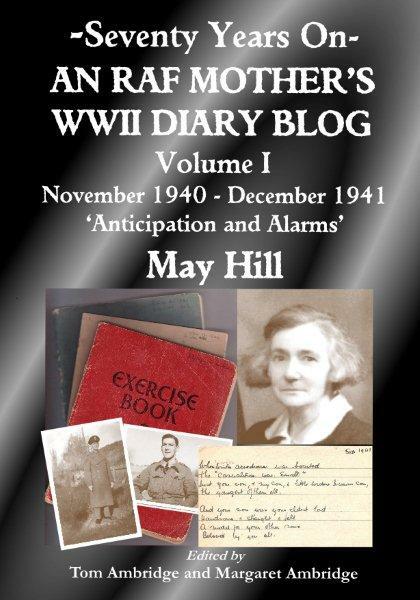 I did not intend it to be a record of war, when I started my diary, just our ordinary doings during the days of war. In spite of good intentions the war creeps in, as it has crept in and around all our daily life. So tho’ no record of battles and campaigns is kept, a little of the trend of war is threaded thro’. The second front looms ever nearer, then we shall feel the effects in this country, more than we have done since the “Battle of Britain” and how very little we knew of that down here just sheltered behind the sand-hills, while the tide of war went over only a few stray bombs that only damaged property, not people, fell round us. Wed. night the newly-hung bacon which was just beginning to sparkle with dry salt crystals, turned wet again, I think it was the rain and humid atmosphere. Hams wept salt tears all day yesterday and even the flitches, hung in the white-tiled corner near the fire were weeping by evening. Weather has changed again, I looked out when Jean went to school and it was clear and cold, the morning star shining brightly over the Point. I hope it does not freeze with the sunrise as I put my chrysants out in the rain yesterday and forgot to bring them in, and they have been in so long it would nip the new shoots I expect. The two cats have eaten their bread and milk and are sleeping on the mat. Snip nodding upright but “The Sprogg” curled in a ball. He still coughs but I am sure he does his best to suppress it, as I put him outside if he coughs more than once. I do not think it healthy to have sick cats in the house, and they are hardy and have plenty of cover to go to. Rene said Mrs Shales had fallen and hurt herself. She stood on a chair to reach something and it was not level and she over-balanced. Rene did not know until yesterday, she was getting over it then but had been pretty bad. Rene was going in again at night. She herself does not look too well. Think she had a chill early in the week, probably got it on wash-day, it was so cold. I am reading the book, “Bachelor in Arcady” which Aunt Jet gave Jean (she sent “The Rosary” to Mavis). It is very readable and amusing. She also gave her 5/0. Amy gave her two for music. Flitch – side of bacon – salted and cured abdominal wall of a side of pork. ‘Bachelor in Arcady’, was written by Halliwell Sutcliffe who died in 1932. He wrote many popular novels, most of them historical romances set in the Yorkshire Dales. ‘The Rosary’ by Florence Louisa Barclay was first published in 1909. It has been described as one of the most beautiful books ever written, and the author compared to Jane Austen. It is available in the publc domain as a free e-book. Father on watch at 6 a.m. brought me tea and bread and butter. He has tea and porage before he goes and takes tea and sandwiches (mutton to-day) and mince-pie and cheese with him for lunch. Jean bought the “Tibs” and dosed both cats. About 15 minutes later said “The Sprogg” already looked better! Am sorry to say I can hear him coughing now. I was cold after Father got up so rose at ¼ to 7. It is nice to get up and dress by a good fire these cold mornings tho’ I do not as a rule like coming down before getting dressed. I am sorry to find I get a touch of my old enemy again, it was nice to be free from it while convalescing from “influe”. I wonder what kept it off then. Perhaps one “peg” drives another out. Anyway it was only “scotched” not exterminated apparently. 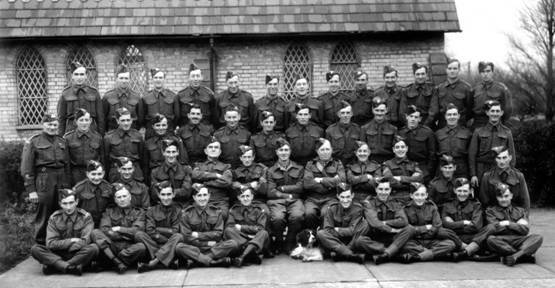 Montgomery is in England to take charge of British Invasion Army under Gen. Eisenhower U.S.A. Gen. People are wishing sec[ond] front would be started, but when I think of it, I think of the hundreds of boys for whom these days are the last they will see, and every day is one more for them before they pay the price for our peace and safety. Some of them go with heavy hearts, the first excitement of war is over and the grim bare bones of all its wickedness show thro’. 7.50. Queer bumps I can hear and planes. Moon is not set I think but it is cloudy. Hope it is not Ger. dropping bombs or one of our planes crashing. Wonder if we bombed Berlin again. It must be terrible to live in Ger industrial towns now. Hitler’s huge …….…. [? word missing] was bombed a few nights since. His shelters underneath were in three tiers with 7ft concrete on top, but our bombs crashed thro’. I hope if I have to die in a raid it will be in the open, not buried under piles of debris. May God send help to all in distress. The weather in Italy is cold, snowy, and wet, but I think Ron has good warm clothes. In Emmie’s letter he said he had got trousers made to fit him. At first they were a lot too long, rather tight under the arms and seating room for two! Planes still coming in, should think one was dumping his bombs in the sea, where they all ought to be dumped. Don’t think Tom is very thrilled with C.G. [Coastguard] job now he has got it, tho’ as he is now put on for aft. patrol he may like that better than watch box duties. Sprogg came in when I opened the door, think Jean’s Tibs must have taken effect, he is so loving (most unusual) and is singing all the time. The missing word, which May probably intended to insert in the gap later after checking the newspaper, was probably ‘Führerbunker’. Had 2 more recently written letters from Ron, one dated 18th and one 22nd June then yesterday 4 more! Jean’s written in June the rest in May. He is not in tents but billets now but regulations have been tightened up again. He can’t tell us where he is, nor send parcels. Says he is working hard at times, was fit and well, had been cooking until 9 p.m. one day. They get one day off in 3. It is very hot and the flies are very troublesome, said he was surrounded by the bodies of those he had killed and the others were tracing all around him. His clothes had just come back from the wash, spotless. He was so pleased, he likes nice clean clothes and hates to wash them. (We have washed Father’s khaki suit this week. Looks ok only I upset “Thawpit” bot. over it. Hope the white ring comes out.) He longs for home. I wish the war was over and he was home. There seems to be a lull just now like the calm that comes when we say the wind gathers strength for a harder blow. These sunny summer days are the last that many a lad will ever see, let us not be too hasty in wishing the sec[ond] front would start. I fear that before another June comes round many hundreds will have gone. Had a long letter from Frank Adams. 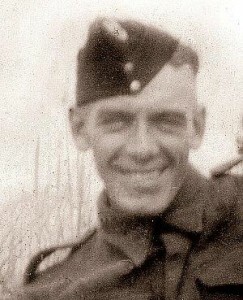 He went thro’ the last campaign in Africa from Alamein to Tunis but cannot tell us where he is now. We are so pleased he is safe. He sang “Baudelaire” to an old French couple and they said “chante tres bien” and then he sang “Tipperary” and the old man’s face lit up. 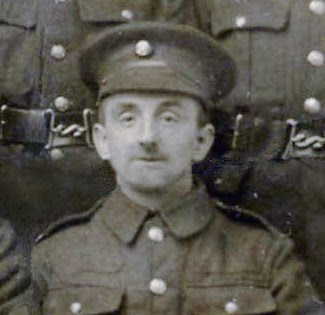 He had been in the last war and recognised it at once. They rescued some rabbits and kept them some time, also 5 hens which laid every day. Altho’ there are small raids in the country almost every night we do not black out now when Father is at home all night. He is on 6 days leave now. It is never really dark all night. Jean has gone to Margaret Pickers for the day. 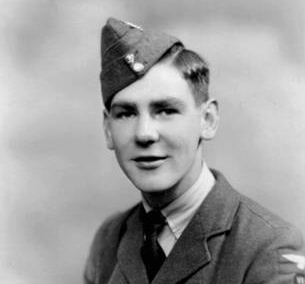 Ron was in Malta when his letters were written, having sailed from Sfax in Tunisia to Valetta Harbour 8th – 9th June 1943, according to his own Diary (courtesy Brian R Hill).